Chipocrite, a.k.a. Paul Weinstein, uses original Nintendo Game Boys, often accompanied by guitar, bass, drums, and/or other instruments, to create complex audio masterpieces. 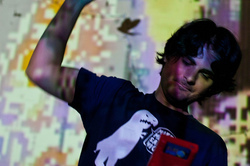 He has performed at numerous concerts, events and conventions, including the Vans Warped Tour, Blip Festival, MAGFest and AnimeNEXT; provided soundtracks for commercials - including a nationally televised GameStop ad - as well as video games and online videos; and released three EPs in addition to his first full-length album, "Wordplay," in December 2014. Chipocrite is currently working on the soundtrack for "EarthNight," a rogue-like runner game coming soon to PS4 and other devices.